Pumpkin is the flavor of the season. 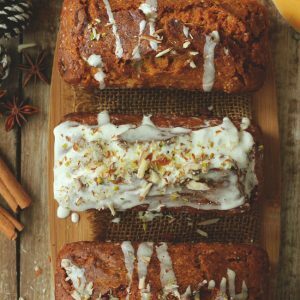 Whether it is the cheesy pumpkin pasta, pumpkin soup or the pumpkin cake, we are eating all things delicious loaded with loads of pumpkin. And why not? After all, it is the fall season. Our favorite time of the year. There is a pleasant nip in the year and the evening air is filled with a coziness. What could be a better way to celebrate this season than a good, old-fashioned pumpkin cake. Hence, we baked Chai Spiced Pumpkin Cake. This is the best cake to celebrate the pre-Christmas time. While soaking the dry-fruits in rum for the classic Christmas cake I love to take a bite of my favorite pumpkin cake with a cup of green tea. Last week I made Pumpkin Cheesecake Trifles and had some pumpkin puree in hand so decided to use it wisely in this pumpkin cake. It is loaded with the flavor and aroma of the Indian tea spice blend which is the combination of cardamom, cinnamon, nutmeg, and cloves. The chai ka masala compliments the flavor of the pumpkin perfectly like a match made in heaven. The earthiness of spices gives a delicious punch to the sweetness of pumpkin. 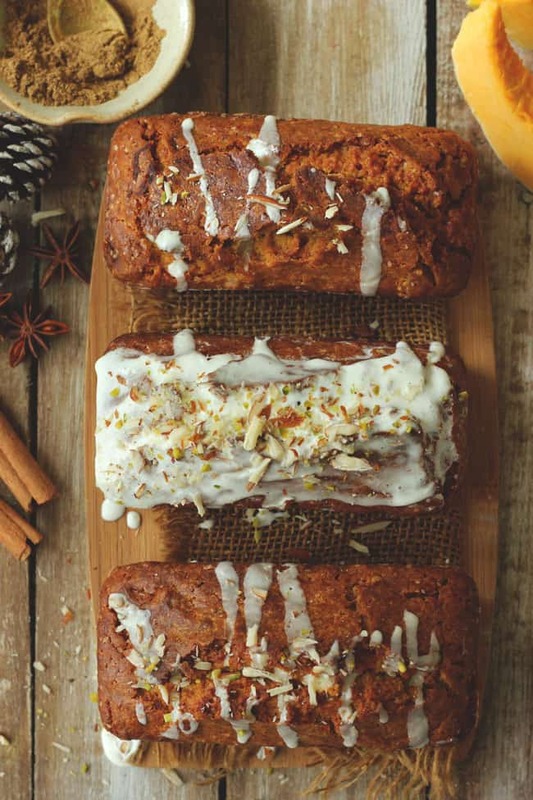 Making this pumpkin cake an absolute winter favorite bake. I have used homemade chai spice mix for this recipe. The tea spice blend is easily available in any Indian supermarket. Or you can add, a teaspoon of cinnamon powder and half a teaspoon of nutmeg powder instead of chai spice mix. That will give you a good taste too. I have baked this cake in the cute tiny loaf tins. Why? I love to share them with my family and friends and those small pumpkin loaf cakes make a perfect edible gift for the holiday season. Everybody just loves them to the core. 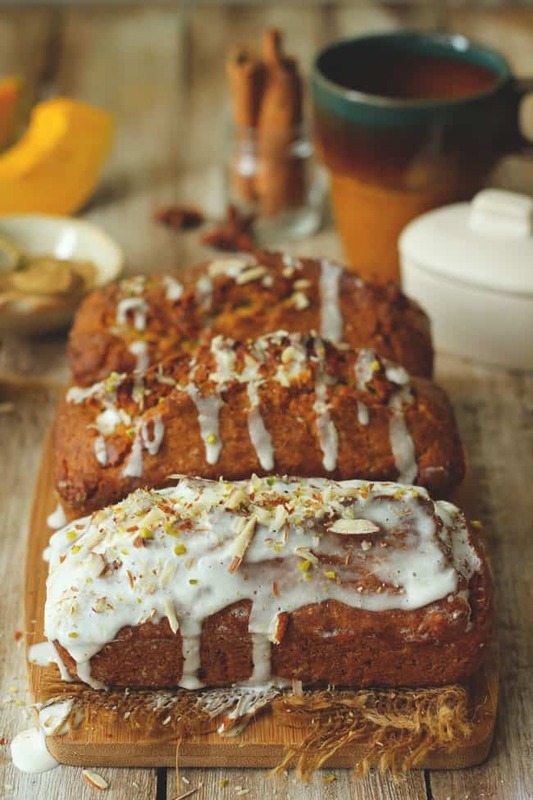 If you planning to go generous with your edible gifting spree then bake this cake in a big single loaf tin. Either way, you are going to win many compliments for your baking skills. 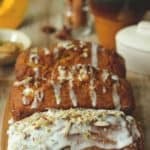 Chai Spiced Pumpkin Cake is the best cake for the fall season. Grease 7″ square tin with oil or you can use 3 mini loaf pan. In a large bowl, whisk together pumpkin puree, brown sugar, eggs and oil until all combined well and creamy in texture. Do not whisk for too long after adding the eggs. Sift all the dry ingredients together including the chai spice in a separate bowl. Add the dry ingredients to the liquid batter in two batches. Using spatula mix well to make a smooth batter. Do not over mix the batter else result will be a hard cake. If the batter seems to be thick add 2 – 4 tbsp of milk and combine well. Preheat oven at 180 C. Pour the batter in the prepared tin. Bake for 40 – 45 minutes. Once golden brown on the top and a tester comes out clean, cake is ready to come out of the oven. Let it cool down completely at room temperature over a wire rack before cutting into pieces. For the glaze, mix all the ingredients with a wire whisk until it is of dropping consistency. 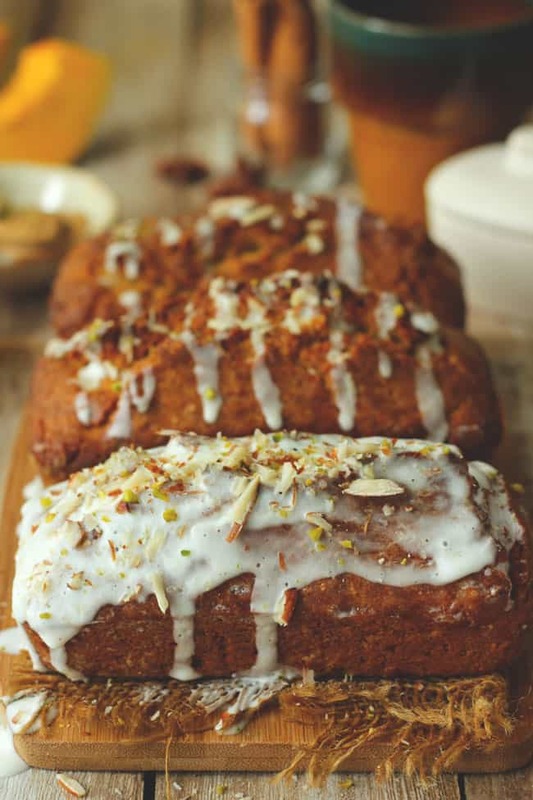 Drizzle the glaze over the cake and garnish with chopped pistachio and almonds. 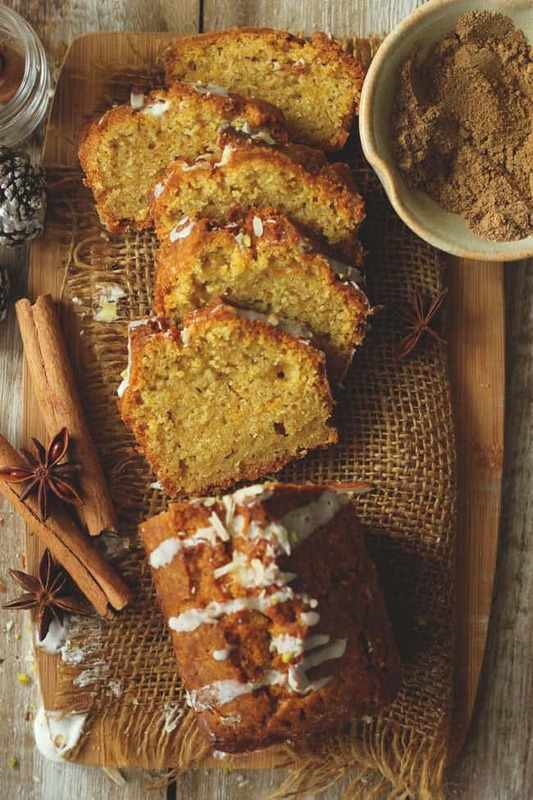 Serve Chai Spiced Pumpkin Cake for the teatime.